Our authors consider the various mythic and historic settings in which the recent discoveries made around the Ryukyu Islands may finally gain acceptance in archaeological and geological perspectives. Unusual submerged landforms have been found off the coast of the Ryukyu islands in the westernmost region of Japan. These clusters of islands were once part of a vast trading network extending between Japan, China and Java, and maintained tributary relations with China throughout late prehistoric time (circa 8,000 BC). Scattered off the coast of many of these islands at a depth of approximately 5 to 25 meters are stone terraces that show characteristics of sunken platforms. Limestone concentrations resembling coastal terraces found in several Ryukyuan sites have sharp edges, right-angles, and unusual arrangements. Hypothesis suggests that these ocean terraces are natural structures that may have been utilized, modified, or enhanced by humans in ancient times. There is evidence that islands in the Pacific have disappeared over known geological time. It has been estimated that 15,000 years ago, during the Quaternary cold, ice caps several thousand feet high covered North America and Eurasia, resulting in a lowering of the sea level by 15 meters. It is also known that Indonesia belonged to the same large landmass as southeastern Asia. Our investigations in the Ryukyu Archipelago confirm this geological change, where terrace-like formations as well as caves that were once exposed to air were submerged by the oceanic dynamics of the late Pleistocene and Holocene epochs. The glacial cycle for the region of the Ryukyu Archipelago is given at 130,000-10,000 BP (Before Present), defining the last interglacial stratigraphic framework for the coastal paleoclimatology and North Pacific. During the Upper Paleolithic,1 period, at the time of the last glaciation, in the climatic period called the Late WÃ¼rm (c. 30,000 -10,000 BC), considered the most harsh from the point of view of climate, sea level fell to about 330 to 425 feet (100 to 130 m) below the present zero level. There is growing evidence that late Pleistocene2 groups achieved more complex levels of cultural development than has been generally known. Such an explanation can be satisfactory only for a very narrow time-frame (20,000 -10,000 BP) because consideration of Eurasian material culture after 10,000 BP shows a disappearance of paraphernalia for several millennia, and thus suggests not a continuity in complexity but rather its collapse in time. Prehistoric cultures in the coastal region of South China made use of terraces built along river and ocean fronts at sites selected for agricultural and navigational expedience. This culture then spread its knowledge by land and by boat along the coast, and several cultures adopted these same methods of using terraces to prevent runoff and erosion of resources. Most Asian anthropologists consider that later passageways were made to the neighboring off-shore islands of China and the southern Japanese islands. And although the prehistoric sites which have been investigated in recent years seem to support this assumption, the evidence of these underwater monuments seem to indicate that a land bridge first brought this early terrace and pottery culture to the Ryukyu location during the early Neolithic. The sea-going population of the Lower Yangtse, who colonized the South China coast in prehistoric days , might have regarded the Strait of Taiwan as a large lake. The activities on the island side of the water are evident. Ever since the last century, Japanese scholars have done a great deal of work on Taiwan, and they were recently followed by the members of the Academia Sinica (Taiwan). Dozens of sites have been reported, most of them located along the west coast. Their distributions and stratigraphy seem to suggest that the mainland cultures arrived on the island in successive waves. Archaeological data from Taiwan clearly shows that the prehistoric cultures of the island owed their origin to those that flourished earlier on the mainland. Thus from Lung-ma in South China to Taiwan there emerged various structural remains in the settlement such as natural waterways, ditches, stone stoves, dwelling pits, storage pits, terraced platforms, and city walls that become the signature of eastward expansion. Much of this was covered over by early Austronesian settlements as studied by Professor P. V. Kirch in his investigation of the early ancestry of oceanic cultures in the Pacific. The connection of prehistoric Japanese pottery with the mainland is also apparent. Sites in central and southern Japan yield a lithic industry akin to southern China with pebble-flaking, chipping, pecking and polishing as its basic techniques. Typical artifacts, such as those unearthed at Kozanji, Kutobo, Ubayama, and the southern Japanese islands are pebble axes, pointed picks, short axes, waisted axes, shouldered axes, and others, all common in China and Indo-China. The pottery is basically a brownish grey cord-marked ware which has a wide distribution in the Western Pacific, but similar “Jomon” artistic examples have extended as far as Peru. In the hands of the Japanese island potters, this art was developed with unusual skill. Besides the common cord-marked decoration, shell scraping and corded and carved stick impressing were introduced, and a large number of pots were decorated with highly ornate reliefs. The pottery gives Japanese prehistory (19,000 – 3,000 BP) the name “Jomon” which means literally “cord-marks”. A profound connection between Taiwan, the Ryukyu, and China is evidenced in a combination of chipped and partially polished rectangular hoes, stepped adzes, and shouldered axes. In the early Neolithic period (12,000-10,000 BP) these could have been used to modify stone surfaces and territory for commerce or build terraces for agriculture. Ancient stone “vessels,” their exact age unknown, as well as stone tools also of unknown age have been found on Yonaguni. The stone “vessels,” which may have served ritual functions, range in size from about half a meter to two meters in their longest dimensions and appear to be carved of the native sandstone. One beautiful celt-like stone tool in particular that was found on Yonaguni (presently in the possession of Dr. Kimura) is composed of igneous rock, possibly a diabase, that is not found exposed on Yonaguni Island. Either this tool or the raw material from which it was manufactured was transported to Yonaguni in ancient times, furnishing evidence of an ancient stone-working tradition on Yonaguni independent of the underwater structures. If we look at the larger picture, we see that a possible connecting blueprint clearly exists throughout China and Japan whether it is seen in the pottery, primitive tools or in the mound and terrace structures. The movement of the phenomenon of sun worship and corresponding symbolic sun crosses and fire serpent motifs on pottery can also be found in Japan and China. Sun worship, serpents, platform architecture, and terrace-culture, however, are not limited to the Western Pacific. Raised slabs and terraces with posts are common throughout Polynesia, and at one “ahu site” on Easter Island called Vinapu, temple rocks and statues are structured to show the significance of extended ceremonial platforms. Elaborate stone terraces are also seen at Hanalapa me’ae in Polynesia and in the Marquesas islands of the mid-Pacific. In the South Pacific, terrace platforms as special places of gathering were called luakini heiau, a term introduced by the Menehune people who brought the art of heiau building to the Hawaii islands. In the traditions of Ka Po’e Kahiko, the Menehune were the earliest people to populate Hawaii, using stones from Kawiwi to build platforms in Wai’anae. The Ka Po’e Kahiko culture understood the cardinal points (Kukulu) in accordance with the rising of the sun in the East (the Kukulu hikina), the traveling of the sun to the west (Kukulu komokana), as well as the south (Kukulu-hema) and the north (Kukulu ‘akau). The platforms for these astronomic points show striking similarities to structures on Ryukyu such as Sheri Castle and some of the other restored castles on Okinawa. These similarities are represented by an overall design and architectural plan, including the downward sloping stairs, levels, terraces, and masonry. Was it possible that throughout the vast oceanic regions, sun worship was the key to oceanic platforms from Talepakemalai on Eloaua Island in the Bismarck Archipelago to platform sites at Lolokoka in Tonga and Wai’anae in Hawaii? Were these just places of worship, or could they indicate a rudimentary understanding of astronomy serving cultural, religious and astronomic purposes? Archaeological similarities have been found between immigrant and indigenous groups scattered throughout the ten thousand nautical miles of the Pacific in what has come to be called the “Lapita3 culture. This represents an ancient legacy of art and pottery which may be nothing less than a ethnographic conduit that spread throughout Oceania. The Lapita may be the “missing link” now being accepted as the “Asian Ancestors” of the Pacific Oceanic World! Another missing link might be connected with an ancient pre-Japanese peoples called the Ainu, an isolated group with possible Caucasian ties, who live on the northern most island of Japan and may have migrated across the Northern Pacific to North America. 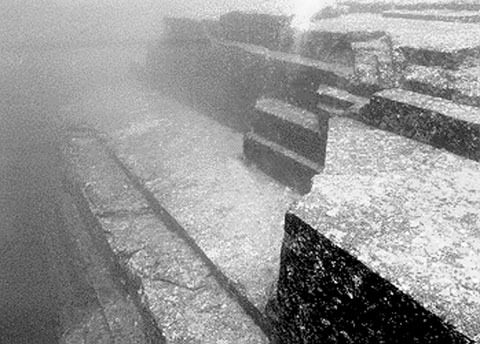 A deciphering of the name “Ajimu” may throw some light on the sunken underwater structures of Yonaguni. It is a corruption of Azumi which means “Sea People,” in earliest Japan. Until the end of the eighth century AD, the Azumi were among the most powerful sea-faring tribes in Japan, but after the Nara Dynasty was established, they declined in strength. Terrace cultures were at one time also prominent in South America. NASA satellite photographs of Tiahuanaco, Bolivia in the late 1980s revealed an extensive yet forgotten array of stone patterns and platforms which were recently determined to have been used by early cultures to manage a sophisticated irrigation system at high altitudes (4,000 m). These platforms are adjacent to ancient monuments and structures that served as ceremonial centers, exhibiting sun and stellar alignments, as well as containing water conduits for ceremonial rituals. And what about the Mayan culture with their platforms, sun worship rituals and astronomically aligned structures? One can argue that in the Chinese architectural tradition of temple platforms, vertical discrimination of space was three-fold, including ground level or neutral planes, elevated or positive planes represented by platforms, and pits or negative planes represented by sunken courts. Most sunken courts had two aligned flights of steps on opposite sides, one for descent and the other for ascent, designed for ritual procession into and out of negative space. Yonaguni tombs in the coastal regions imitate the same step functions found on the submerged platforms, viz., two or three steps, usually of different heights, connecting each platform horizon in elevated or sunken space on one side with great systemization of space. A similar three-tiered symbolic structure can also be found throughout South America. In terms of architecture, terrace arrangements—whether agricultural or ceremonial— throughout South America, Polynesia and Japan similarities of structures do exist. The structures seen in the waters off of Okinawa and Taiwan in this context do not appear as unique structures. One author (Hurtak) has found mathematical relationship between terrace-cultures around the world. Serious hypotheses concerned with the origin of various items of culture and language have sought to link the Pacific peoples with America or with eastern Asia through migratory routes both to the north and to the south. Linguistic and cultural resemblances between the Japanese and the Polynesians have been pointed out, and analogies have been traced between art forms and cultural items of the Chinese and those of various Pacific islands peoples. Concepts about Asian migration to North America have expanded in many directions in that the Bering Strait is now considered not the exclusive connection between East and West. Although genetic research on the “˜Richland” or “Kennewick” Man (the name being used for the 9,300 year old skeleton found near the Columbia River in Washington State) represents an unprecedented finding in the history of the Americas, and is of major interest as perhaps part of the culture that took part in the migration, the recent Monte Verde discovery also lends a new direction to a pre-Clovis man movement in South America. In reconciling geology and mythic history, any set of phenomena can be explained by an infinite number of hypotheses, and we must choose between them. Masaaki Kimura’s Mu—Underwater structures of Ryukyu? (in Japanese, 1991) and Lost Stone Tablets (in Japanese, 1997) represent a latter-day synthesis of archeological research and ancient legend. Kimura provides an environmental and ecological hypothesis designed to account for human origins and diversity of cultures in the Pacific as coming from one parent civilization. Although not widely appealing to most archaeologists, in all honesty, Kimura does accurately depict ancient legends from an Oriental perspective, making it difficult to choose among such differing hypotheses as those that can be fashioned from ideas about ancient legends versus archeological evidences. Two problems which have attracted much attention in the study of Pacific island peoples are those of their origin and their dispersion. Many theories have been put forward to explain where they came from, by what routes, and how they managed to settle over widely scattered islands throughout a vast expanse of ocean between New Guinea, Easter Island, and the Hawaiian Islands. Another allied problem is that of the source of their culture. Myths of ancient China date back to oracle bone inscriptions 30,000 BP, the earliest tradition of scribal notation on astronomy and star navigation. The historic records, inscriptions and traditions show an interplay involving a series of solar myths, flood myths, myths about the creation of the universe and the sinking of lands in the Pacific commonly referred to as the legendary Meru or Mu. The term “Mu” is also very important in the life story of the “Son of Heaven—Mu,” who comes to earth as an example of prehistoric creation. Among the many Chinese creation myths one finds the exploits of the Hunter Ho -wang-mu who is looking for the heavenly land on Earth called Hai-wang-Mu. The breaking apart and destruction of the land of Mu and the sinking of the “Sun of Mu” are stories whose authenticity seems beyond doubt, having been deeply embedded in the minds of the Chinese people. Japanese historic traditions carry on a popular “Mu myth” by teaching that their first thirty-six generations of emperors, beginning with Jim-Mu and Kim-Mu, came from the region of the Sun. Thus the use of the “rising sun” symbol exemplified the meaning of the divine power on earth that was to spread light throughout the world connected with the divine island of Japan. The question is asked: “Of what use can knowledge of Mu be to humanity?” To some, of little practicality , but there are many who would be glad to know the origin of man’s early movements and cross-cultural interactions over “unknown areas” of the ocean. At this stage of history it may be important to know the triggers on which has been based the fabric of the various cultures that have existed around the world. This knowledge could serve to correct the misunderstandings that have been major obstacles to understanding our dim planetary past. 3 The Lapita culture is made up of early Austronesian-speaking Neolithic population that colonized Oceanica (Melanesia, Micronesia and Polynesia) around 3,500 BP. Akiyama, Kenzo. Studies in the Relations between Japan and China (in Japanese). Iwanami Shoten, Tokyo, 1939. Ri Jo Si, Rok Records of the Ri Dynasty, Vol. 7, p. 677-678ff, Gakushuin Daigaku, Toyo Bunka Kenkyujo: Tokyo, 1967. Cheng, Te-kun, Prehistoric China. Cambridge: Heffer and Sons, 1959, pp, 44-133. Churchward, James. The Lost Continent of Mu. London: W.C. Daniels, 1988. Clottes, J., and Courtin, J. The cave beneath the sea: Paleolithic images. Cosquer, New York: Harry N. Abrams, 1996. Cook, James, Voyage toward the South Pole and Round the World, 2 Vols., Blackwell: London, 1777. Kimura, Masaaki, “Ryukyu in the Late Quaternary,” in Journal of Geography (in Japanese) 105 (3), pp. 261-268, 1996. Siskei-Meishou, Cultural Properties of Okinawa. Part III. Kindaibijyutu Ltd.: Naha, 1996. Thomas, Michael F., “Tor” in The Encyclopedia of Geomorphology, edited by Rhodes W. Fairbridge, 1968, pp. 1157-1159. Stroudsburg, Pennsylvania: Dowden, Hutchinson & Ross. Also see Chang, K.C. “Prehistoric Ceramic Horizons in Southeastern China and Their Extension into Formosa,” Asian Perspectives, Hong Kong, Vol. 7, Nos. 1/2, pp. 243-250.